NASA's Mars Reconnaissance Orbiter, which has been studying Martian terrain since it was launched 12 years ago, recently discovered a feature on the Red Planet's surface that has left researchers baffled. The space agency released a photo of a deep "circular formation," estimated to be hundreds of feet across, which was spotted somewhere near the south pole of the planet. The gigantic pit is surrounded by a sheet of frozen carbon dioxide, which is dotted by more shallow circles that were left in the ice after sunshine caused parts of it to sublimate into gas. 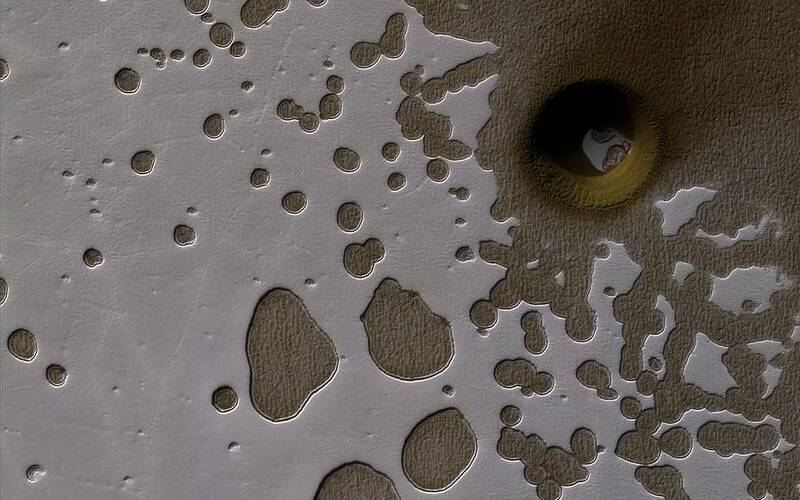 This type of land formation is dubbed "Swiss cheese terrain" after its uncanny resemblance to the porous dairy treat. NASA currently has two top theories for how the deep pit formed: The agency believes it could be either an impact crater or a collapse pit. An impact crater would mean that an external force, such as a meteorite, crashed into the planets surface, leaving the strange dent. A collapse pit may be the result of any number of internal planetary factors, ranging from volcanic activity to melted ice.